An urban couple go camping in the Canadian wilderness – where unimaginable beauty sits alongside our most primal fears. Alex is a seasoned outdoorsman while Jenn, a corporate lawyer, is not. After much convincing, and against her better judgment, she agrees to let him take her deep into a Provincial Park to one of his favorite spots – the secluded Blackfoot Trail. They push further and further into the woods, Alex stubbornly insisting that he remembers the way. After three days their path disappears; they are hopelessly lost. “Hey, rodeo, here’s your medical kit and there’s a whistle in there. “Backcountry” isn’t really a horror, but it’s a damn thrilling movie. 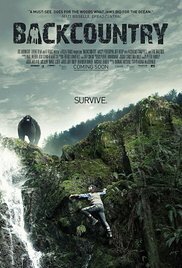 Look at it more as a survival movie where a fearsome-looking black bear becomes the principal actor while wandering through a Canadian forest. The movie makes you nervous and will make you start nail-biting while you’re waiting for what will happen next. It’s evident what the film is about ultimately. Take the terms backpackers, idyllic pine forest and a-hungry-black-bear-who-is-not-so-cuddly-looking-like-the-one-in-your-daughters-bed, and you’ve pretty much described the whole movie. The only question is when and where disaster will strike and how hard ! In other words 90 minutes of shivering and wiping away cold sweat. And this is preceded by a magnificent interactive role-play where you’re witnessing a change of power you didn’t foresee to happen. Alex (Jeff Roop) is determined to take his girlfriend Jenn (Missy Peregrym) to the Restoule Provincial Park in Ontario. Particularly to the famous “Blackfoot Trail”, a beautiful spot where he has spend most of the time when he was there as a kid. It’s obvious that Alex is an experienced backpacker who apparently knows the entire park by heart and has covered several miles there already. That’s why he refuses a map of the area offered to him by a Park Ranger (Nicholas Campbell). Jenn on the other hand looks to much dusted off with her flashy hair style and her smartphone she consults all the time. She’s a corporate lawyer who grants Alex the pleasure to take her on this trip through some unspoiled nature. As confident as Alex is, so insecure she is. She’s also equipped with an emergency flare and “Bear spray”, although Alex already assured her that they’ll probably only encounter squirrels. First, there is an unexpected encounter the first night with Brad (magnificent played by Eric Balfour), a pretty intimidating guy with a heavy Irish accent, who apparently organizes hikes in these forests and invites himself to eat the fish caught by himself. What follows is a magnificent spectacle in which the two men try to outdo each other in a game of uber-coolness. There’s even the spontaneous symbolic gesture of Brad to mark his territory by urinating firmly. After this there is not more than the sight of the couple who diligently pursues its path to the final destination. Alex leads the way with determination, until he comes to the conclusion that they are completely lost. And then the power exchange unfolds with Jenn taking matters in her own hands, while Alex gradually transforms into a heap of misery and turns into an uncertain wimp. Beautifully filmed, this gradual transition. Telling more about this rather tense confrontation between man and nature, would only reveal too much and completely nullify the pleasure of watching it. Let me put it this way, in the end it feels a lot like other films in which individuals are faced with life threatening situations. Whether it’s in “Jurassic Park” where Robert Muldoon (Bob Peck) is being attacked by some velociraptors. Or those three men in “Jaws” floating around in their fishing boat and intensely looking to the ocean anxiously waiting for the big white shark to strike. The atmosphere is identical. A tense atmosphere with the harassed and helpless future victims enduring panic moments and with every snap of a twig, bang on the ground or unknown animal sound they startle. It’s indisputable that the final confrontation is the most exciting of the entire film. Still, I think it’s an achievement of Adam MacDonald to make an entertaining and exciting movie with so little plot data and story material. Whether it’s based on a true story or not doesn’t matter eventually. I suppose the chance to encounter a hungry bear in a forest is obviously much higher than in the middle of a big city. And I’m sure there exist numerous cases of such a clash. Unfortunately, the well-known setbacks were also in this film: defense weapons which aren’t within reach or simply weren’t used. Plus the usual obstacles occurred. But don’t let this prevent you from viewing this movie. Drag a few pine trees in your living room and start a cozy campfire in the middle of the room, so you can enjoy this thriller full of survival and primal instincts.